Our brain consists of two hemispheres; left and right. 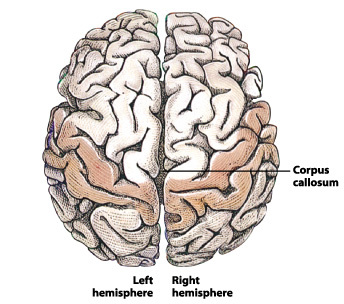 The two halves communicate with each other through a connecting fabric called as corpus callosum. For patients suffering from a form of epilepsy, corpus callosum needs to be severed to reduce the effects of epilepsy. The patients will lead a normal life after the surgery. But after removing this connecting fabric the two halves of the brain cannot communicate with each other. Few interesting facts about our brain were discovered by studying these patients. If you show a picture of, say, a chicken claw to just the left side of the eye (which means the picture will be processed only by the right hemisphere of the brain—the visual one, with the window) and one of a snowy driveway to just the right side of the eye (which means it will be processed only by the left hemisphere—the one with the communicating staircase), and then ask the individual to point at an image most closely related to what he’s seen, the two hands don’t agree: the right hand (tied to the left input) will point to a shovel, while the left hand (tied to the right input) will point to a chicken. Ask the person why he’s pointing to two objects, and instead of being confused he’ll at once create an entirely plausible explanation: you need a shovel to clean out the chicken coop. His mind has created an entire story, a narrative that will make plausible sense of his hands’ discrepancy, when in reality it all goes back to those silent images. Gazzaniga calls the left hemisphere our left-brain interpreter, driven to seek causes and explanations – even for things that may not have them, or at least not readily available to our minds. Most of us with a perfect corpus callosum behave in the same way like those without them. We are wired to tell simple stories to explain complex things we do not and cannot know. These stories are called as narratives fallacies. Humans are biologically inclined to turn complex realities into soothing but oversimplified stories. Taleb argued that the limitations of the human brain resulted in our species tendency to squeeze unrelated facts and events into cause-and-effect equations and then convert them into easily understandable narratives. These stories Taleb wrote, shield humanity from the true randomness of the world, the chaos of human experience, and, to some extent, the unnerving element of luck that plays into all success and failures. Few examples of narrative fallacies are given below. Gentleman - I have high blood sugar. Me        - Sorry to hear that. Gentleman - Do you know why I got it? Me        - I do not know. Gentleman - Jupiter is my lord planet and because of it I got blood sugar. Me        - How can Jupiter give you sugar? Gentleman - Jupiter is a sweet and affable person. Jupiter is a gassy planet made up of hydrogen and helium. Blood sugar is a carbohydrate made up of carbon, hydrogen, and oxygen. Jupiter is very far away from us and it cannot affect us in anyways. But instead of telling I do not know this gentleman made up a simple story. One of my friend had a good vocabulary in English. When asked how, he told that his father is very good in English and he got it through his genes. I believed in his statement for a long time until I came across the following. Genes do indirectly control the manufacture of bodies, and the influence is strictly one way: acquired characteristics are not inherited. No matter how much knowledge and wisdom you acquire during your life, not one jot will be passed on to your children by genetic means. Each new generation starts from scratch. A body is the genes way of preserving the genes unaltered. Instead of attributing his vocabulary skills to his hard work and environment he made up a simple story using his father’s genes. Instead of attributing the outcome to luck this person created a story. Is there a way to avoid narrative fallacy? There are few things that we can do minimize narrative fallacy (1) Accept that the world is complex (2) Luck and Randomness play a huge role in life (3) It’s ok to be ignorant and say that I don’t know instead of blabbering nonsense (4) Learn basic statistics and probability. Read the book The Drunkard’s Walk. 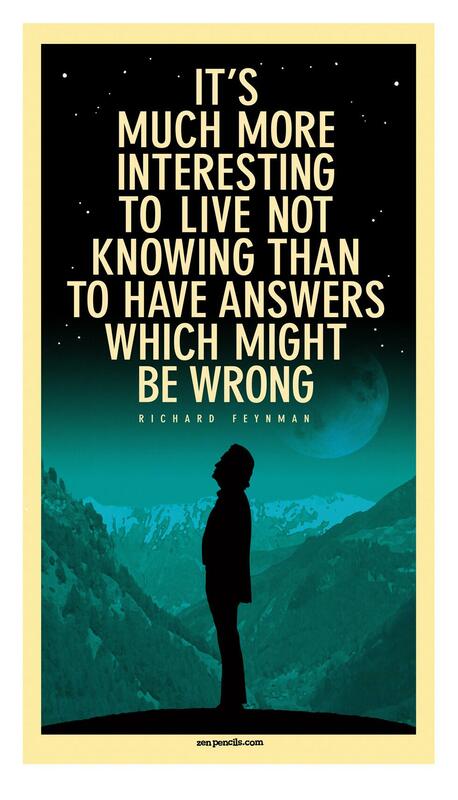 It’s much more interesting to live not knowing than to have answers which might be wrong – Richard Feynman. I like you blog its very insightful. Can you setup full rss feed for your blog. Woerdpress is blocked in our office. I understand that you might want readers to visit blog directly. Thanks. I will setup a full rss feed. By default wordpress enables RSS feed. Is this sufficient for you? Currently i use feedly as rss reader, i can add your feed but it give me partial article and provides link to your blog for full article which unfortunately i cannot access due to my office restrictions. I fixed it. The feed should have full content now. Great and thanks for verifying.